28% of you are blogging away, and folks are loving it. That’s up 7%, so more people have tried, and more have had success. Always a great thing to hear. 10% of you have given it a shot, but it’s not working out. I think the Church Marketing Lab discussion board could be a great place for this. Ask yourself three quick questions. Is my audience aware that I have a blog or would they read a blog? How is my site design? Am I blogging material relevant to my audience? Talk to the kind folks in the Church Marketing Lab, and I’m sure someone would love to help you with your site. 4% of you tried, but you gave up. Let us know your story in the comments, are you a pastor who tried, but it didn’t work out Are you an intended reader who helped in the project not working out? I’d be interested to hear why these sorts of things fail. 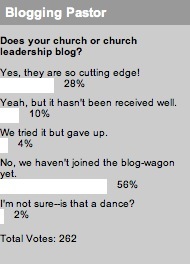 56% of you still haven’t joined the blog wagon. My quick response is, “Good grief! Go blog!” My better response is that maybe this is a great idea. Don’t try to do something you don’t need. Keep it simple, but consider blogging. Only 2% of you still have no idea what a blog is. If you’re in that 2%, consider being discipled in technology. I don’t know that I have a link to help that. So, you might be wondering whether you should comment on this post. There’s a few types of people who should. Are you a SuperBlogger? Tell us why you think it works. Is your blog struggling? Ask for some advice. Are you a blogger feeling rejected? Let us know why you think it didn’t work. Anyone else? Heck, just let us know what you think. In the mean time, this week, we want to know, will your church do a Thanksgiving service? Head to the right and let us know. OK, you pulled me in. I’ve been blogging for over two years. I average about 4 posts a week – you know, quality over quantity! The few in my church who read my blog enjoy it! I can’t say that it a very useful ministry tool. However, I continue to blog because it’s been useful for me and my spiritual journey. It’s helped me clarify my thoughts, and to become a better writer/communicator. Bottom line is that I blog for myself and my family. My family likes to read it! I blog regularly. I have a lot of hits, but the site’s audience is mainly focused on church leaders and I don’t think too many people in my congregation read it. But I’m always surprised at who is reading it. A blog is just a really fascinating medium. One Sunday morning, when I was preaching at my church, a blogger from an athiest site picked up one of my posts–and entitled it a “sermonette.” Two other athiest sites picked up his post. By the time I got home, I had preached at church, and strangely enough, I had virtually “preached” to thousands of de-converts. I started blogging a few weeks ago, and I’ve done surprisingly well at keeping up with it. I think I’m ready to “go public” with it, and start getting some readers. What is the best way to get the word out on the net? Cause I have a feeling most people in my community have NO CLUE what a blog is or how it works. Earlier this year, I was encouraged by my publishers to begin a blog in advance of the publication of my new book, Building a Healthy Multi-ethnic Church. I was sekptical at first, but found an encouraging voice in veteran blogger DJ Chuang (www.djchuang.com). He helped me find a rhythym (once a week on Wednesdays) that felt comfortable with, and one that allows me to distill things I might otherwise say into (hopefully) something relevant to my readers from week to week. My subscriptions are on the rise and I have found myself actually looking forward to posting. In fact, I often have to restrain myself from posting on days other than Wednesdays so as not to become overzealous in the effort. Bottom line: Try it, you’ll like it! Just a thought. I started this summer blogging after a year and a half of considering it. I read the Blogging Church first. That helped alot. One thing I have done to direct folks in our church to my blog among, putting it on our church website and bulletins, slides during sermons, is probably the best thing for me. I have done an email newsletter, just a short letter to our church each thursday for about two years. Every week I put some of the titles of my blogs, and do at least one good tease if possible. I might have 500 check out my blog that day. Some weeks I have had as many as a 1000 reads in just a couple days following the chruch email. Of course you have to keep in mind the size of your church. We have approx. 2000 email addresses we email each week. So if you have a 100 you will get a much smaller amount of clicks. JUST DO IT!!! !